When the owner of this spec house wanted something truly unique, the design prepared by Brian Van Bower met the mark on all levels, creating an elongated waterfront jewel that perfectly complements a stylish home. The fun thing about working on spec houses is that, every once in a while, you run into a client who truly wants to blow the doors off – in the best way possible, of course. 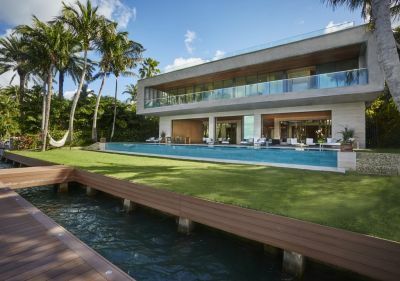 That was certainly true here: The home is right on the water on one of the islands in Biscayne Bay where Miami’s elite prefer to live, and the eventual asking price for the property was in the $26 million range, give or take. It’s an area where few limits are ever placed on the design imagination, and we jumped at the opportunity to participate when the call came. The key detail in the design is a gigantic acrylic panel that is just three feet tall but spans 63 feet across the waterfront – a shimmering gem out front of a spectacular architectural statement. Acrylic panels are wonderful features in all sorts of watershapes, but in typical applications they are small enough or set up in such a way that their very slight flexibility isn’t an issue. In this case, however, the great length of the panel raised a concern: What if the weight of the water in the middle of the edge caused it to deflect even a tiny bit? What effect would that have on the performance of the vanishing edge? Could it conceivably crack? No to worry, said our chosen panel supplier. The solution, quite simply, was to make the panel thick enough to withstand the outward pressure – in this case an unusual four inches of thickness. But what this also meant with a panel 63 feet long and three feet tall was tremendous weight and an interesting set of fabrication, delivery and installation issues. The panel arrived on a long truck bed (left), weighted down and stabilized by an immense I-beam that was subsequently used to crane the 63-foot-long chunk of thick acrylic safely into place (middle left). Once sealed into a slot perfectly prepared to receive it (middle right), the panel was stripped of its protective covering and readied for watertight service (right). Throughout the design process, we worked in close communication with Hammerhead International, the panel fabricator based in Las Vegas, Nev. The support staff there figured everything out for us on an engineering level and sent along detailed specifications to Miami-based Regency Pool & Spa, which had signed on to build the pool to the design we generated at my firm, Aquatic Consultants (also in Miami). Before long, the panel arrived by truck – laying flat with a huge beam across the top to prevent any movement or warping in transit. After that nerve-racking trip, it was transferred to a barge for delivery to the waterfront side of the property. A crane lifted the panel and gently lowered it into place: It was a perfect fit, and the placement and sealing processes went off without a hitch. The pool was beautiful even before finishing touches were completed with the deck and landscape (left and middle left). Now the view of the home from the water is truly spectacular (middle right) – and the view out from the deck (right) is none too shabby, either. The overall pool system is a four-sided perimeter overflow, with the panel on one side and a conventional slot-overflow detail on the other three sides. To ensure a slightly greater flow over the acrylic panel, it was set an eighth of an inch lower than the adjacent edges. The flow was then carefully adjusted to keep water moving down the full perimeter. The watershape itself is essentially a long lap pool that gets to a depth of six feet in the deep end. The entire watershape is lined with Travertine – a sleek finish to go with an amazingly beautiful pool in a great setting. The key to a project like this is clear and open communication. When you’re working with a client who sees only the sky as a limit, it’s easy to get lost in the idea phase and end up in a situation where you need to reboot your thinking as the realities of materials, costs and construction set in. In this case, however, we’d had enough experience already with high-stakes projects that we kept our focus and moved forward well informed about and confident in the capabilities of our panel supplier and in the practical skills of the builder who’d signed on to install the pool. The result of this collaboration between owner, designer, supplier and builder is something special – a statement destined to help a spec house pay off handsomely, which it did.